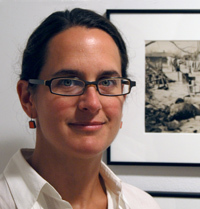 Natasha Egan is Associate Director and Curator at the Museum of Contemporary Photography at Columbia College Chicago. Egan has organized numerous international and national exhibitions such as Alienation and Assimilation: Contemporary Images and Installations from the Republic of Korea; Andrea Robbins and Max Becher: The Transportation of Place; Consuming Nature: Naoya Hatakeyama, Dan Holdsworth, Mark Ruwedel and Toshio Shibata; Manufactured Self, photographs about how we identify ourselves through what we consume with international artists from Africa, Asia, Europe and the United States; Made in China, visually focusing on the global impact of manufacturing in China through photography, video and installation; Loaded Landscapes looking at historical and contemporary sites of trauma and conflict; The Edge of Intent examining the utopian aspirations of urban planners and how their visions adapt to changing environments; Reversed Images: Representations of Shanghai and Its Contemporary Material Culture; and The Road to Nowhere? for Fotofest 2010 Contemporary US Photograph with eighteen US artists. Egan has contributed essays to such publications as Shimon Attie: The History of Another (Twin Palms Press, 2004); Photography Plugged and Unplugged (Contemporary Magazine, 2004); Brain Ulrich: Copia (Aperture, 2006); Beate Gütschow LS / S (Aperture, 2007); Michael Wolf: The Transparent City (Aperture, 2008); Placing Memory: A Photographic Exploration of Japanese American Internment (University of Oklahoma Press, 2008); and Stacia Yeapanis (Aperture 2009). In addition, she teaches in the photography and humanities departments at Columbia College Chicago and juries local and national exhibitions. She holds an MA in museum studies, an MFA in fine art photography, and a BA in Asian studies.